A few quick words on Thatcher. Firstly, an old lady has died. She was a mother and a grandmother. Don’t trample over the grief of those who have lost one whom they dearly loved. Secondly, on the wider debates taking place, it is wrong to analyse the reaction to Thatcher’s death through the prism of the debating society. Turning this into an -ism is to already be detached from what it is and was that many were so angry about. It is a gentrification of reality, not the blood and guts version that many lived through and about which feelings remains so raw. This is not mere anger at intellectual defeat. This is not rage about losing a popularity contest. To suggest and really believe so is either ignorant or arrogant. Take your pick. Thirdly, the rise of postliberalism, indeed even of UKIP, can help us understand the response of many. These new movements recognise and tap into a sense of mourning, a sense of nostalgia for a society now lost. They know many feel a sense of sadness at a changing and changed world, enough to be radicalised by it. Sadness that their country is changing and they feel they can do nothing about it, sadness that they feel strangers in their own lands, sadness that the strong communities and identities of the past are no longer available to them. This feeling incites genuine rage in some, bitterness in others, regret in still more. Yet when casting about for a cause, there is little tangible for them to point at and the shifting culprit tends to be some nebulous concept – liberalism, or unrestrained capitalism, or globalism, or the EU, or immigration, or just politicians generally. Some will project onto a face the cause of their anxiety and despair, (Herman van Rompuy, anyone? ), but this usually speaks only for a small segment, not all. The North (and of course not just the North) too mourn changes over which they had no control. They too feel their communities have been rent apart, their shops closed, their employment threatened (or wiped out), their way of life decimated. They too mourn a way of life now lost forever and find their new alternatives uninspiring and less dignified than their old. Powerlessness and poverty mark a proud people, and it hurts. Only, they do not feel they need to point to a vague concept as an explanation. For them, there is no need for vicarious pantomime villain as there is no doubt who was the cause of this. It was Thatcher. They were there, they lived through it, they know what happened, they know it was her. Whereas others might be marked by apathy and alienation for lack of a defined and definite foe, so the anger and radicalisation of others can be explained by the feeling that they know precisely who their enemy was. Quibble with their comprehension of politics, indeed history, by all means, but for many there is a face to their demise, and that face is of Margaret Hilda Thatcher. Making placatory appeals to progress, to the necessity for the economy to modernise, simply won’t cut it. And to be fair, if the North (and many other regions) was sacrificed on the altar for the wider good of the country, then little surprise that bitterness still exists towards the one who wielded the knife. Some would argue that this is simplistic, that time has passed and we must assess Thatcher’s legacy within the broader sweep of history. And they’re right. But it is important to recognise that those who grew up detached from the pernicious effects of her rule tend to find it rather easier to be magnanimous about her legacy. 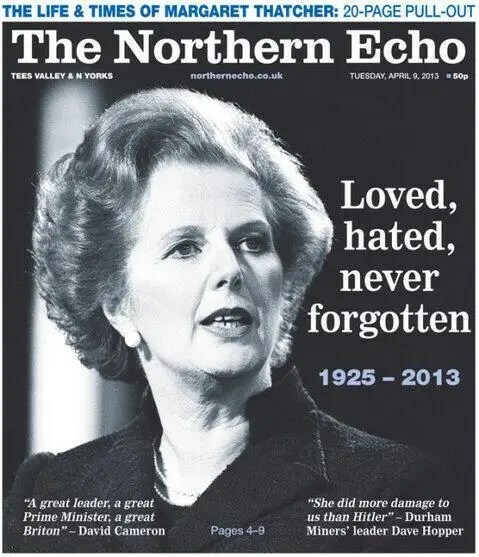 Indeed, Tories falling over themselves to beatify Thatcher are succeeding only in demolishing any gains David Cameron was ever likely to make in setting up his Let’s Take Back The North style campaigns. Perhaps, then, this will be the enduring legacy of Thatcher – to have shaped a new breed of Tory MP who will remain forever strangers in the lands of the urban North. By MichaelMerrick in Politics and Society on April 10, 2013 .